*WARNING: A pig was most definitely harmed in the making of this post. If you’re squeamish, skip this one. If you like tasty, delicious pork and all it’s derivatives, read on. There comes a time in every girl’s life when she realizes she is not in control of her relationship. She is not the driver of the “You + Me = Domestic Bliss 4Eva” bus. She is not the master of her fate or even, as it turns out, her own bathtub. No, there is a day when a girl walks into her lovely pink and white bathroom after a long day at work, and discovers a 56-pound pig lounging on ice in her bathtub, right next to the Jo Malone White Jasmine and Mint bath oil and the Kate Somerville ExfoliKate facial scrub. Honey, look what I found on my way home! Can we keep it? 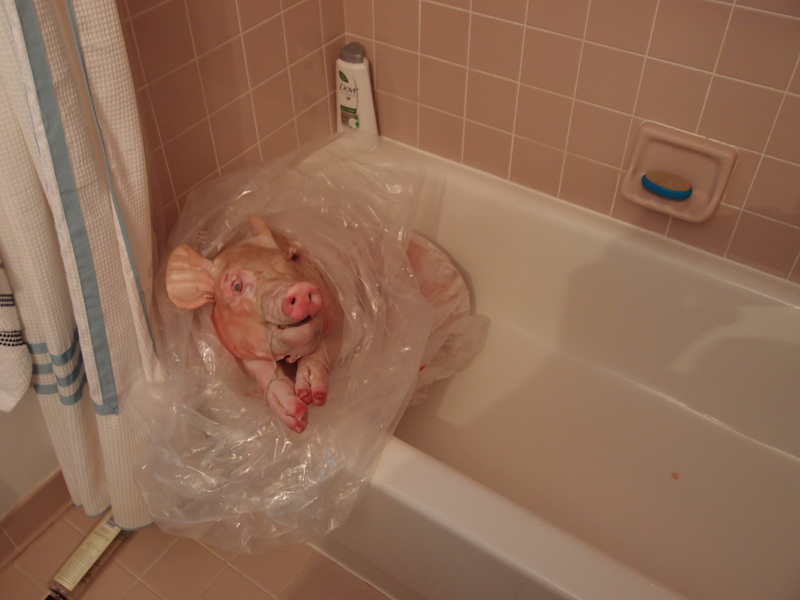 The story of how this pig came to be in my tub is a long one, debated and revisited over several months. 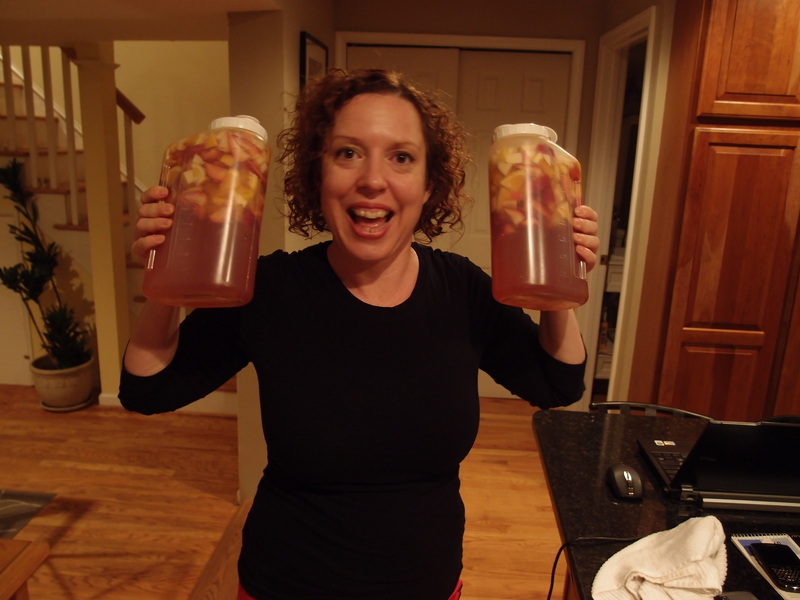 But in the interest of not driving myself crazy, here’s how I came to accept what has become known as Porktober. I will use the Kubler-Ross Five Stages of Grief model to illustrate. Once in the second stage, I began to realize XFE was quite serious and I raged against Men’s Health and the entire publishing industry. My anger also took the form of ridicule towards the animal kingdom (“Pigs are so stupid.”), the cooking industry (“Roasting is such a stupid way to cook something.”) and domesticity (“Boyfriends are so stupid.”). I received sympathetic nods and increased personal space from those within earshot. This is what I woke up to at 6:30 AM on Saturday morning. Honey, can you pass the creamer? The third stage involves the hope that the individual can somehow postpone or delay the inevitable. Since the planned pig roast was timed to coincide with XFE’s birthday, I tried to lure him away from the idea with promises of parties at other sparkling locales, complete with DJs, disco lights and bartenders (He likes DJs! He likes disco lights! He likes bartenders!) Alas, alack, he also likes cooking large animals over an open fire and impressing large groups of people with his culinary skills, which are, fair enough, substantial.) There was even a half-hearted attempt at blackmail involving XFE support at a half marathon in Annapolis in late November, which I dropped when I remembered I don’t like running (or doing anything else) in the cold. 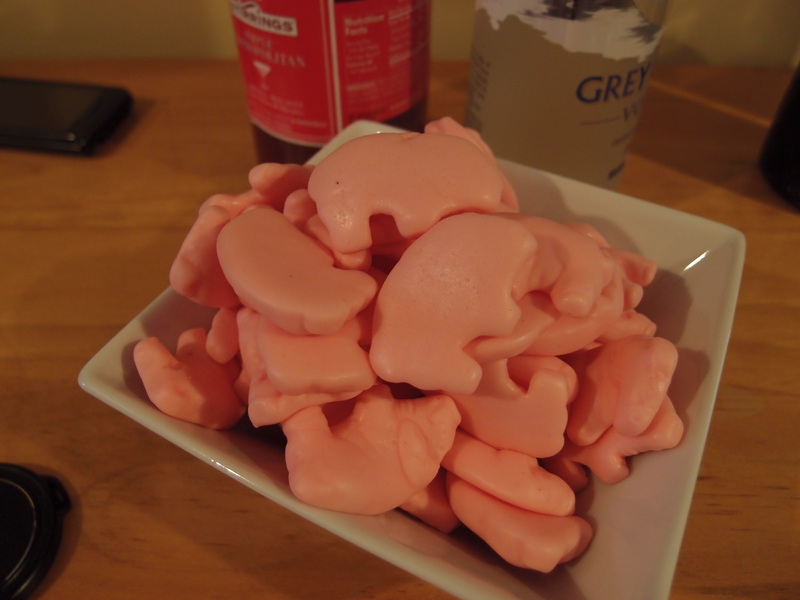 Darling, wouldn’t you just rather have some nice little sweet cherry gummy piggies? Wouldn’t you just?! During the fourth stage, I began to understand the certainty of the now-named Porktober. After all, invitations had gone out. Spits had been rented, medieval trussing needles procured. Steve the butcher had been contacted. As the event grew closer, I became more silent, withdrawn whenever pig talk came up. I began to disconnect from my affection towards pigs. I used my Porktober-depression as an excuse for being distracted at work and slacking off at running. Again, there was little or no sympathy for my plight. The only thing that could possibly bring me out of my depression — sangria. In this last stage, I began to come to terms with the pig roast and even found humor in the situation, which is, after all, my normal coping mechanism. There were also a lot of eye-rolls and snarking during the final prep and assembly of the pig, which, while perhaps not qualifying as 100% acceptance, is again, a part of my coping mechanism. And so, gentle readers, after finally processing these stages, I let go of my expectation that I was in control in this relationship and fully embraced the concept (if not the execution – *insert eye roll here) of Porktober. And, even though it meant conceding dominance, I’m ultimately glad I did. 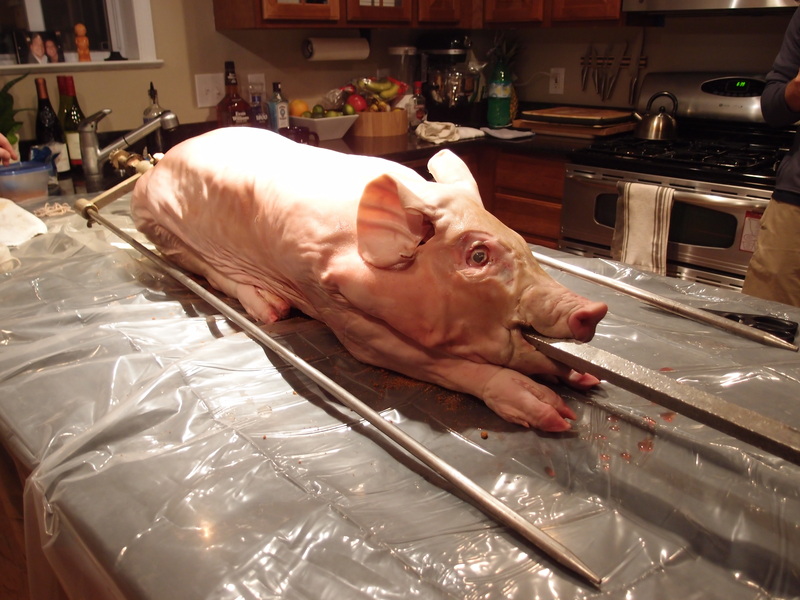 After all, everything from the planning and prep to the oohing and aahhing when XFE and his co-conspirator Leland pulled the pig off the spit made XFE so happy. He was pretty entertained for several months. And, it was, after all, his birthday. Then, things got very medieval around here. Other than the bathtub pig storage (my bathroom is the only one with a tub—that’s how I lost out on that deal) and the post-pig-rainy-day-cleanup, we actually had a lot of fun. I’ll give more details in the days ahead. Along with more pig pictures, of course. Don’t let you significant others see it….they might get ideas. At least Running Buddy Amy was there to cheer me up. We were pretty damn cheerful by the time that pig was done. Has your significant other ever gotten his way on a crazy idea? How did you deal with it? What bargaining/concessions did you get in return?